The authentic glass Pandora charm collection has an amazing depth of color for any taste or occasion! As per pictures shown size 13x10 hole size 5mm BRASS METAL FINISHING WITH SILVER. With great pleasure, we present a collection of Pandora Beads in India and abroad. The uniformly shaped Pandora Beads, we offer, are known for their flawless finish and intrinsic designs. The Pandora Beads are commonly offered in circular and cylindrical shapes. Offering Pandora bead with silver plated metal core. 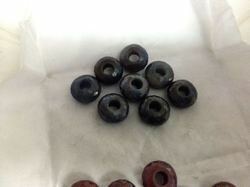 Size is 12-14mm with 5mm hole. 15 MM ZIRCON STUDDED PANDORA BEADS. CAN WEAR AS CHARM IN BRACELETS WITH 3.5MM HOLE FOR CHAIN TO PASS THROUGH. Assorted designs shapes size of fancy glass beads. We have stylish collection of Pandora beads in many designs, shapes with silver plated metal core.These beads are an important component of jewelry and impart beauty to them beauty. The large hole Pandora Beads are used for stringing on leather and other thick cords to make the beautiful necklace & bracelets which is very highly demanding now a days.